The term hat trick is reserved for a player scoring three goals in a game. 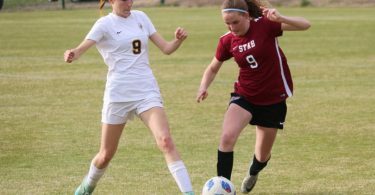 If there were an equivalent for registering three assists, Albemarle girls soccer’s Madeline St. Amand could have a say in the naming process. 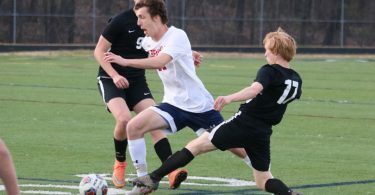 The freshman forward set up three of Albemarle’s five goals Thursday night, each scored by different players, in a 5-0 win home win over Monticello. The Patriots (4-0, 2-0 Jefferson District) had several chances in the first half, including when St. Amand was all alone on the left side of the box in the 13th minute. But Monticello keeper Erin Mathews came through with a sliding save, one of eight that she registered on the night. St. Amand missed just wide left on a shot on the 24th minute, and two minutes later a free kick from Megan Schantz beat Mathews but went clanging off the crossbar. Albemarle finally broke through in the 34th minute when Reese Quillian curved one into the upper corner of the net from just outside the box, a shot so precise it surprised everyone in the stadium, including Quillian herself. After halftime, Albemarle quickly added to its lead with a 48′ tally credited to Lauren McDonald off a cross from St. Amand. The ball deflected off a Monticello defender in an unfortunate bounce, doubling the Patriots’ advantage. St. Amand’s speed again led to AHS’ third and fourth goals–this time on crosses from the other side of the pitch to a waiting Maggie McMullan, who calmly deposited it into the back of the net for a 3-0 lead, then the next to Liz Yow in the 67th minute. Another freshman, Reilly Bonham, put one in from 20 yards out in the 78th minute for the final margin. While young players excelled on offense, the experienced AHS defense pitched a shutout in more ways than one — the Mustangs (2-1, 1-1) didn’t register a shot on goal all game. AHS will next travel to Orange County on April 8. Monticello will host Western Albemarle on the same day.